← The Basilica Cistern. A breather in Sultanahmet. Best tiles in Istanbul. Rustem Pasha Mosque. 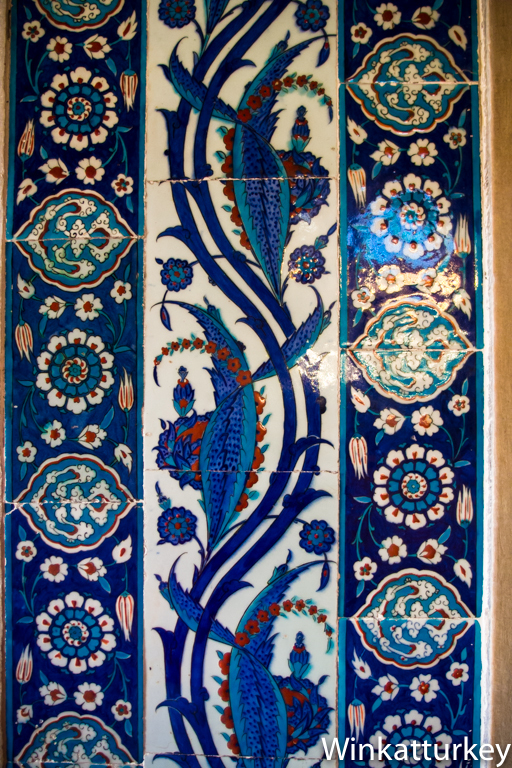 Although many visitors to the city pass in front of it when they visit the Spice Bazaar and the Galata Bridge, there are some that the most superb collection of Iznik tiles are lost there in Istanbul. If we have been impressed by the interior of the Blue Mosque, should not miss this monument teacher Sinan. Here are the works of the best artists who later served as a model for large-scale production used in Sultanahmet. The visit is the incentive to seek entry, very hidden in the alleyways located under the building itself. The Grand Vizier Rustem Pasha was born in Bosnia but that does not stop him from reaching the top of the court of Suleiman the Magnificent and married the daughter of Sultan. Chose a nearby place to Golden Horn Galata Bridge versus to build his mosque and instructed the greatest architects of empire, Mimar Sinan. It is built on the shops in the plaza of the Spice Bazaar across the New Mosque (Yeni Cami) When we look at the Suleymaniye Mosque, see under it the dome of Rustem Paşa. The entrance to the mosque is from the street of shops under it right, as we come from the Galata Bridge. We went through a small gate and climbed a ladder to deck out to the upper terrace. Once there, We can admire the magnificent tiles that built this mosque. Once inside of the octagonal building, see its dome 15 meters in diameter but the decor captures the spotlight. Tiles are the early period of Izmik (1555-1620) which was characterized by the use of a nice red color that was the envy of potters from around the world. Almost all the great artists of the day and all orders received strived to meet the Grand Vizier, one of the richest empire and certainly the most powerful men behind the Sultan. These collections are then copied to decorate Blue Mosque but mass production requiring huge imperial mosque and the lack of funds made the final quality is not comparable. The difference has increased over time as the tiles Rustem Paşa also best stood the test of centuries and are now in much better shape. At the output we can buy small reproductions of tiles and other memorabilia that are sold for the continuation of the building.